Have you tried on the Nike LunarCharge for size yet? Nike Sportswear’s latest lifestyle creation is a combination of some of the most iconic running models to ever feature a Swoosh, as the Nike Air Max 90, Nike Air Presto, Nike Lunar Flow, and more all served as inspiration for the sleek slip-on upper. 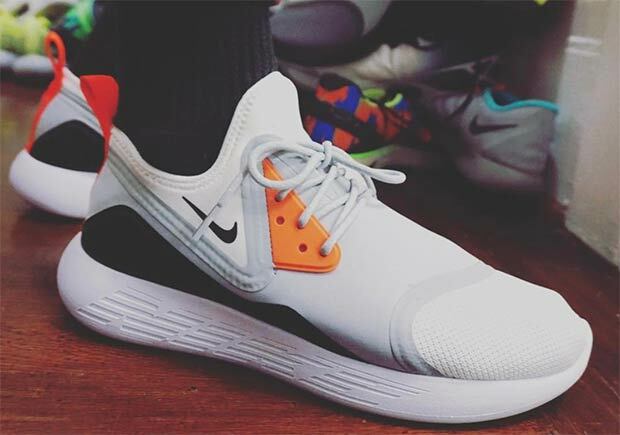 Now it looks like Nike has something special for the coming Air Max Day festivities, as the Nike LunarCharge LE was recently spotted in some familiar colorways first featured atop some classic Air Max offerings. Right away you’ll notice the Nike Air Max 95 “Neon” serves as inspiration for one of the pairs, as a greyscale upper features a new black Lunarlon midsole and outsole unit while accents of that Neon Volt shade hit the heel tab and small Swoosh branding. The Nike Air Max 90 “Infrared” is also hinted at in the above photo thanks to Infrared splashes on the actual AM90 influenced lacing system for an added retro touch. It looks like some ‘Oreo’ speckling is headed to the model as well. Check out more of these OG Air Max-inspired colorways on the Nike LunarCharge LE below and we’ll keep you updated on a Release Date right here on Sneaker News. Update: The “Air Max 90 Infrared” Inspired Nike LunarCharge Essential BN is now available at nikestore.com in both men’s and women’s sizing. Update 2: Nike also releases an “Air Max 95 Neon” Inspired Nike LunarCharge Essential BN in women’s sizing on nikestore.com.